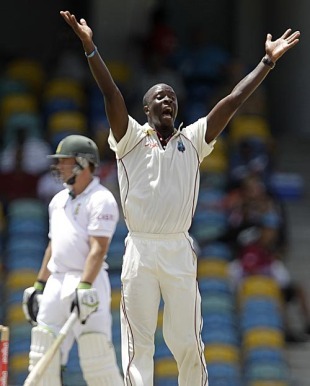 Kemar Roach, the West Indies fast bowler, is ready to battle the tough conditions of Sri Lanka and lead his team's attack during the three-Test series. West Indies arrived for their tour on Sunday, having prepared at a training camp in Barbados, and Roach is eager to build on the promising start to his international career. He made a name for himself by roughing up Ricky Ponting during last year's tour of Australia, particularly a head-to-head during the Perth Test when Ponting had to retire hurt, and Roach has taken 26 wickets at 29.69 in his seven Tests to suggest he can be a fixture in the West Indies side for a long time. However, pitches in Sri Lanka can often be hard work for the fast bowlers and the home side boast a powerful batting line-up including Kumar Sangakkara, Mahela Jayawaradene and Tillakaratne Dilshan while they will also be on a high after a successful tour of Australia. The pressure will be on Roach because he has inexperienced support in the shape of Nelon Pascal and Andre Russell with Jerome Taylor and Fidel Edwards still sidelined. Roach, though, is not perturbed by the challenge ahead. "The pitches in Sri Lanka are quite flat but ball tends to swing a bit," he said. "If you can get it right as a fast bowler, you can be quite successful. I have been working on swinging the with the coach. I still have a little bit of work to do on my lengths, but I'm satisfied with what I got out of the camp. It will be challenging but I'm willing to take on the challenge and do what the captain wants me to do and what is required to help the team." The West Indies squad has been put through their paces ahead of the trip with an intense training camp and now have a three-day match starting on Thursday to prepare for the Test series. "I believe I have prepared well and I'm excited about the possibilities as I look ahead to this tour. We had a good camp in Barbados and we did some hard work," said Roach. "It was a lot of hard work but I enjoyed every moment of it. It was good preparation, the ideal kind of preparation, for a tour like this." The series begins in Dambulla on November 16 followed by two Test matches in Colombo before a five-match one-day series and one-off Twenty20.